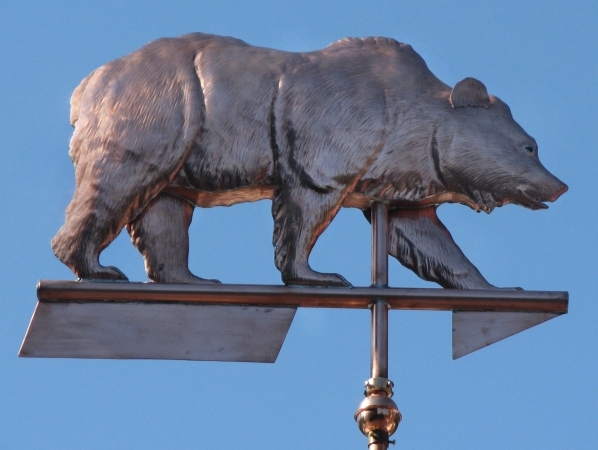 This Grizzly Weather Vane, Ursus arctos horribilis, was crafted from hand hammered and hand shaped copper; it has brown glass eyes with black pupils to give it a more animated appearance. All the ‘fur’ of the bear’s coat was created by hundreds upon hundreds of individually positioned hammer blows. We designed a custom hammer for the sole purpose of creating fur texture in animals such as bears and golden retrievers. (We also have custom hammers to create bird feathers, mermaid scales and reptile and dragon hides). We have changed this design a little bit as our expertise has expanded over the years. Both of these designs are the same basic price. 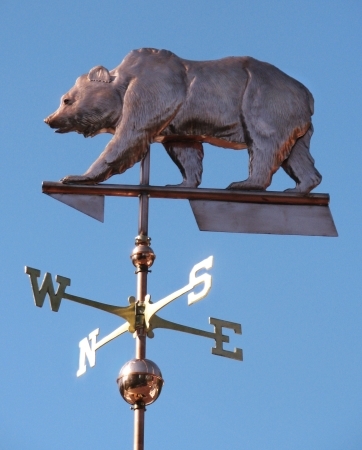 As with all our weathervanes, a Grizzly Bear Weather Vane can be personalized with optional gold leafing. 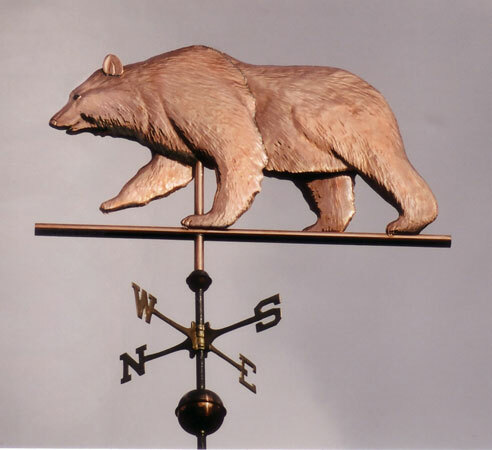 For example, we had a customer who was a graduate of CAL Berkeley (University of California at Berkeley) and he asked us to create a Cal Bear Weather Vane with a golden coat and a fletching with the word CAL in gold leaf on it. Along the same lines, we did another fun project for a woman who was also a graduate of CAL Berkeley. Her husband, a graduate of CAL’s arch rival, Stanford University, was celebrating his 60th birthday, so she ordered an Indian Weather Vane (being the Stanford mascot at the time he attended) to celebrate both his special day and his connection with his alma mater. For years, they have had a friendly football rivalry so she also ordered a Bear Weather Vane in honor of the CAL mascot. They have a second home at Lake Tahoe with two side-by-side dormers. On one dormer they mounted the Indian Weathervane and on the other dormer, the Grizzly Bear. When the wind blows one direction, the Indian chases the Grizzly Bear, but when the wind shifts 180 degrees, the Bear chases the Indian! This way they can symbolically act out their school rivalry. 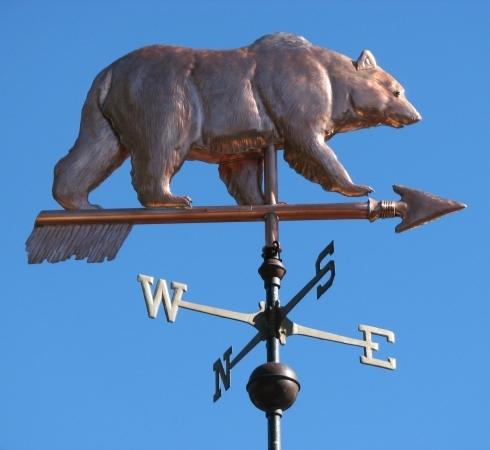 Of course, since the wife came up with the plan, she did make sure the Grizzly Bear Weathervane had the advantage of the prevailing winds, and most of the time you can look up to see the Cal Bear Weather Vane chasing the Stanford Indian! Other famous bears that makes their homes in the sky are Ursa Major and Ursa Minor. Ursa Major, Latin for ‘Larger Bear’, also known as the Great Bear, is a constellation visible throughout the year in most of the northern hemisphere. Ursa Minor, Latin for ‘Smaller Bear’, also known as the Little Bear, is also a constellation in the northern sky. Like the Great Bear, the tail of the Little Bear may also be seen as the handle of a ladle, hence the name Little Dipper. It was one of the 48 constellations listed by the 2nd century astronomer Ptolemy, and remains one of the 88 modern constellations.